James Madison wrote, "If tyranny and oppression come to this land, it will be in the guise of fighting a foreign enemy." But the enemy the government is now fighting isn't just a foreign one, it appears to be fighting its own citizens. Madison underestimated the oppressive nature of a regime constantly at war. Neither George Orwell nor Aldous Huxley could have thought up a novel as frightening as our current intelligence apparatus. Big Brother has nothing on Big Data. If flying unmanned drones over U.S. soil with the ability to pick off U.S. citizens isn't scary enough, now we have learned of a secret court that approves secret orders for private cell phone providers to turnover data to the government. The data provided by cell phone companies is supposedly 'raw' in that it only provides phone numbers and length of calls. The data does not provide information on what was discussed--at least as far as we know, and at least not yet. At the time of this nation's founding, there was a great deal of concern about a standing army. The concern was that a standing army would threaten the rights and liberties of a free people as it would create an ever present threat of force. During the Philadelphia Convention, where the Constitution was drafted during the summer of 1787, the concerns about a standing army were made several times. Madison kept scrupulous notes, as did others. 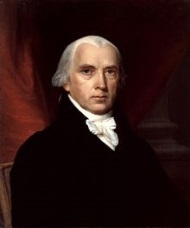 But since Yale University Press no longer publishes the second volume of the Farrand Records, it is James Madison's notes that provides the best insight into what happened inside the convention. On June 29, 1787, Madison said in a speech before the Convention, "In time of actual war, great discretionary powers are constantly given to the Executive Magistrate...A standing military force, with an overgrown Executive will not long be safe companions for liberty. The means of defense against foreign danger have been always the instruments of tyranny at home." Madison's words have proven prophetic. There is a fundamental tension between security and liberty as one must always be sacrificed, at least for a time, for the other to thrive. It is a difficult question that we cannot solve in a haphazard or piecemeal manner. We must first as a people and a government decide which we will defer to when a conflict between the two arises. Then we can make policies, but we must decide where we stand philosophically first. In order to secure our nation against terrorism, if such a thing is even possible in an absolute sense, it will require secrecy on behalf of our government and the willingness of citizens to give up certain rights in certain instances. If that is a price we are willing to pay then so be it. But the choice must be first made by the people; we must be the ones to decide whether or not we go down that rabbit hole. While we are having that debate, we should once again go to Madison who said, "No nation could preserve its freedom in the midst of continual warfare."